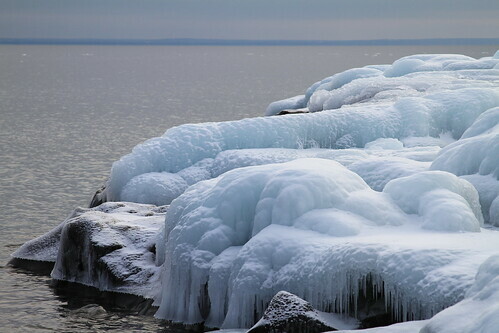 The rise in Lake Superior temperatures will likely place significant strain on the regional economy over the next few decades, according to a new environmental survey. Some of the key findings suggest ice could be absent from the lake within 30 years and within 50 years the lake could drop by two feet. In Isle Royale, the moose population has declined to half the long-term average. Temperatures higher than moose can tolerate are suspected to be responsible–as in nearby northwest Minnesota, where the moose population has crashed in the past two decades from 4,000 to fewer than 100 animals, coinciding with higher temperatures. Also, warmer winters in Isle Royale enable many more ticks to overwinter so that a single moose can be infested by 80,000 ticks, causing such a large loss of blood that the moose are more vulnerable to the park’s wolves, which also have declined in number. Other park mammals at risk as the climate changes include lynx and martens. A survey of moose populations by the University of Minnesota isn’t conclusive, but concerns linger about their numbers. Still, Bayfield Mayor Larry MacDonald says more action is needed to protect the lake. “Anyone who has a dock or a breakwall may be sticking out of the water and unusable,” MacDonald tells WDIO. The study is based on the impact climate change will have on the Great Lakes National Parks but Mayor MacDonald said the findings of this study should concern all who live on the big lakes, including those affected by the shipping industry. Minnesotans react to atrocities in Norway. “Do-nothing” Congress and a family move muddy the Minnesota freshman’s prospects for legislative accomplishments (Star Tribune). A hot, wet summer has sent the mosquito population soaring, raising the odds that West Nile virus may soon make an appearance. “This is the time of year we really need to make sure we’re putting bug spray on,” said Gloria Tobias, disease prevention and emergency preparedness coordinator with Countryside Public Health in Madison (West Central Tribune). The formation of two new college men’s hockey conferences has created uncertainty for St. Cloud State University and the national landscape of the sport. At the same time, it has left Huskies fans with a range of emotions that include anger, frustration and even fear (St. Cloud Times). I drove up from Missouri on my way to BWCA and found Lake Superior to be totally frigid. I would be much more likely to visit in future if lake temperatures were in the 80s and 90s which I experienced Saturday lazing about Table Rock Lake on my noodle. So I hope it warms up for your tourism!